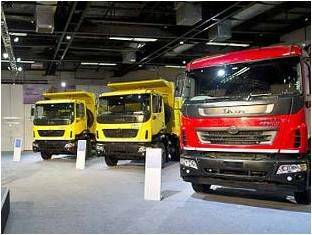 With an eye on beefing up its share in the burgeoning intermediate light commercial vehicle (ILCV) segment, Tata Motors has launched a new range of trucks christened ULTRA. Claimed to be contemporary in style, design and feature, the new ULTRA range of vehicles, Tata Motors believes, will provide buyers comfort in terms of driving and cost of ownership. To begin with, it has launched two models. Tata Ultra 812 will be priced at Rs.10.53 lakh (ex-showroom Chennai). Tata ULTRA 912 will be priced at Rs.10.94 lakh (ex-showroom Chennai). The ULTRA variants will be available in four colours. ULTRA is an entirely new platform, and is modular. The ULTRA range of trucks was showcased at the Auto Expo in 2012. Addressing a press conference here, Ravi Pisharody, Executive Director, Commercial Vehicles Business Unit of Tata Motors, said with ULTRA range of products the company was looking at serving both the domestic as well as global markets. Fielding a range of questions, he said the company was exporting around 50,000 units at the moment. This number would go up to 1.50 lakh units over the next three years, he added. The company would extend its geographical reach in the overseas market by expanding into countries such as Malaysia, Philippines and Vietnam soon, he pointed out. To a query, he said Tata Motors would line up a series of launches so as to have a complete portfolio in the ULTRA range (4 to 11 tonne space). A top company official asserted that the ‘walk through cabin’, triple benefit insurance offer, and AMC (annual maintenance contract) would ensure that the ULTRA range of vehicles went down well with the customers. The ‘walk through cabin’ especially, he said, would serve the needs of drivers in different countries. To a specific query, Mr. Pisharody said the past couple of years had been tough, especially for the haulage segment. Taking a positive view, he said, “Growth will return at some point of time.” He, however, could not hazard any guess as to when. He asserted that one had to take a long-term view of India “which is a growing market.” In this context, he pointed out that the CAGR (compounded annual growth rate) stood at an average 10 per cent during 2004-14.